This WISE Women’s Guide to Investing is fully digital, so you can take it wherever you go. Debra has created the acronym WISE, depicting WISE women as Watchful, Inquisitive, Strategic and Empowered. With these 4 attributes, women can catapult themselves closer to profitable investing; after all, investing is really about common sense, which women are hard wired with. Blog Talk Radio Host Juliet Johnson interviews Debra on just what it means to be a WISE Woman Investor, and they strategize and laugh a lot throughout the 4 hour long audio files. Because Debra surmises that some of you are visuals, like her, she’s also transcribed each interview, so you can follow along with the print version, as you listen. Finally, she’s tied in a very practical workbook, that you’ll be able to put your newly learned skills to work immediately. And, for a limited time, you ‘ll receive a surprise, BONUS digital download. Who doesn’t appreciate something snazzy for free? I can tell you WISE women LOVE freebies! 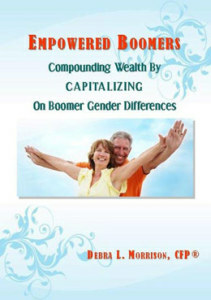 Treat yourself to Ms. Morrison’s wisdom and wit as she walks you through a step by step guide to effective Investing. This pithy report goes a very long way in explaining gender specific brain structure, which results in different styles of communication between men and women. Yes, women’s brains are hard wired for neuron chit-chat across the amygdala, allowing them to multi-task, and with regard to investments, be curious as to how each investment fits into the entire portfolio. Men’s brains are hard wired to send nearly unilateral focus beams, which position them to “get things done”, expediently. The combination of the contextual analysis of a typical female’s brain, combined with the target driven male brain construct can make for some mighty fine investment results. Absent understanding these differences however, couples can get themselves in quite a conflict, which wastes valuable time. Let me know how your communication with your partners and friends is enhanced after applying this knowledge, will you? on Monday, April 30, 2012.